It is certainly not surprising to see a victim of the ‘sentiment’ (of azaadi) positioning himself as a sympathiser of the champions of ‘resistance’ who promote gun, militancy and violence. In Kashmir, the sons of the murdered hold a brief for the ideas propounded by murderers of their fathers. Shah Faesal is a victim of the same ‘sentiment.’ His father was brutally murdered by the militants. That is a reality. But there is another reality. Whether it is Shah Faesal or Mirwaiz Maulvi Farooq or Sajad Lone, the victims of militancy in Kashmir have shown a tendency to ally with the ‘sentiment’ of the murderers of their kith and kin. That is precisely why both Mirwaiz Maulvi Farooq and his slain killers are the great martyrs of Kashmir. That is why the hearts of Kashmiris turned stone cold and did not erupt in outrage when Tamheed Bukhari had to the watch the video of the massive funeral of the killers of his father and silently suffered the indignation caused by the students of Kashmir University who were protesting against the killing of the assassins instead of protesting the against the assassination of Shujaat Bukhari. May the force of morality, the sentiment and its paradox be with Naveed Jutt! Omar Abdullah, in a recent speech, said that thousands of workers of National Conference (read foot soldiers of democracy in Kashmir) were massacred by ‘we know who.’ It may have taken the former Chief Minister two decades to muster the courage to own up his murdered party workers, but his spine is still not strong enough to call out the names of the killers. Not even the names of deceased, or for that matter, the ‘sentiment’ which led to the massacre of numerous mainstream activists. Why? Perhaps, Omar is waiting for the collective morality of the Kashmir to turn in his favour. Paradox, not quite moralistic, of course! DySP Ayub Pandith is a foot note in the history of Kashmir. His own department forgot to organise a remembrance meeting on the first anniversary of his death. Mir Imtiaz’s bride-to-be is not even a foot note, she is an anonymous victim of the ‘sentiment’ — wailing and grieving in a forsaken corner of her house. The funeral of the dozens of SPO’s and civilians murdered in the year 2018 was forbidden — for the force of sentiment was against this breed of Kashmiris, often called ‘taskies’ and collaborators. By the way, Shah Faesal was also labelled as collaborator for his sheer hard work and brilliance. But, that is an immoral story to tell — since he is now seeking collaboration with the wholesale distributors of the label ‘collaborator.’ Paradox, is it not? Reducing the death to a mere statistic has once again become the new normal in Kashmir. Glorifying and romanticising deaths, killings and violence is the only legacy of the captains of the ‘sentiment.’ So, when a brilliant young man, a victim of the ‘sentiment,’ breaks all barriers and tops the most difficult competitive exam of the country — in the imagination of the cheerleaders of the ‘sentiment’ — he is a “collaborator,” an “agent of India,” and an “outcome of the operation Sadhbhavna.” The cheerleaders of the ‘sentiment’ brand him as ‘traitor of the blood of Kashmiris,’ to create a wave of ‘sentiment’ against him, to make sure he ends up as just another number in the vast database of ‘sentiment’: total number of fatalities since 1990. Just like Shujaat Bukhari, Abdul Ghani Lone, Mirwaiz Farooq, Ayub Pandith, hundreds of Kashmiri policemen and the thousands of workers of democracy whose name Omar Abdullah doesn’t remember. Shah Faesal’s aspiration was not martyrdom or death. Because he did not want to end up as a data entry in the database of total fatalities. Because he wanted to live. To show that the act of living is a revenge in itself, in a society whose elites feast like vultures at the banquets of death. In Kashmir, to live and be a symbol of an aspiration, totally detached with the sentiment, is to live against the force of the cult of death. So, an occasional call of the conscience, may turn a victim into an ally of the self-styled moralists, the heroes of the ‘sentiment,’ forgetting the assassins of their kith and kin. For instance, the butchers of 2010 and 2016 are both pretending to be the saviors of Kashmiris in the election season; the grandson of the octogenarian ideologue of the ‘sentiment’ managed to get a job with six digit salary while the ‘calendar’ of 2016 was adding a pile of corpses to statistics of death. But, even that is not the real paradox of Kashmir. Every militant killed has had a Kashmiri informer tracking his movement; a Kashmiri cop hunting him and a Kashmiri politician waiting to sell his death for more funds; a palatial house, an electoral victory; and most importantly, a litterateur waiting to write a heart wrenching article — charging one dollar per word. Every two-three years Kashmir has a collective call of conscience, sometimes in the shape of long queues at the polling booths and sometimes in the form of funeral processions of the deceased militants. Most entertaining are the conscience calls of wannabe conflict entrepreneurs (in this case a wannabe politician) selling another pipe dream: that is the real paradox of Kashmir. The author is an associate fellow at ORF. This article was originally published on Observer Research Foundation. 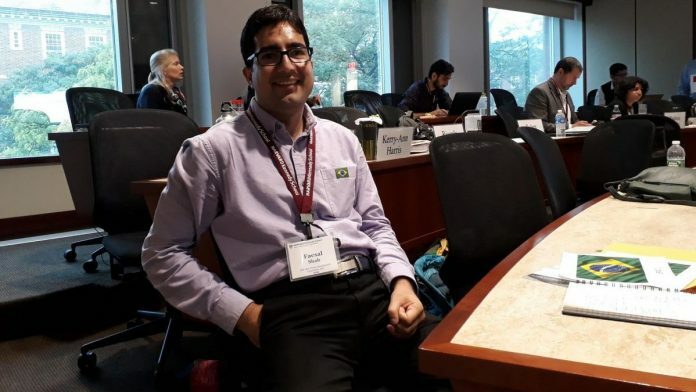 Why Shah Faesal alone … Sitting in Bombay, we feel the pain and agony of ordinary Kashmiris. No death – soldier, policeman, civilian, militant – is a statistic. It is months since one heard about what Shri Dineshwar Sharma is delivering.